Midfielder John Rankin says it's time for Dundee United to "react" as they seek to move off the bottom of the Scottish Premiership table. United have won twice in the league all season and once since Mixu Paatelainen replaced Jackie McNamara as manager. 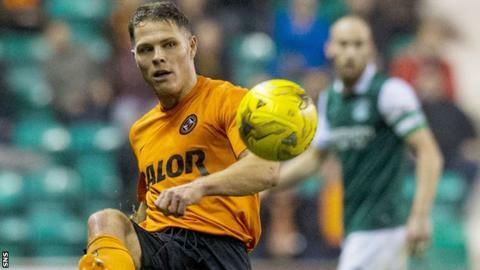 The Tangerines face St Johnstone at Tannadice on Saturday. "After the the international break, you're always desperate to go and get a result the following week and go and get some momentum going," said Rankin. "I'm looking forward to it. We've lost two [against Hibernian and Aberdeen]. Now it's time to react. "I'm confident and I'm positive we'll see a vast improvement over the coming weeks. "If and when we do get three points, it's a case of building on that. We need to get that belief back and that feeling of winning and all that comes with it. Then we'll get ourselves out of the situation we're in." Paatelainen elected not to give his players time off during the international break and Rankin hopes their extra work on the training ground will pay dividends. "Last week, more often than not, we'd have been given four, five days off to go and let our hair down," Rankin told BBC Scotland. "I don't think we're in a position in the league to have time off. "We've not earned the right to go and play in games, that's been our problem as of the last two, three months. Teams have just steamrolled us. "Last week was the time for the manager to work with us and work us hard and try to get us up the table. "We haven't been doing double sessions in the gym, we've been doing double sessions on the training field. "Over the last 10 days, the manager's got a grip of the squad and he's got us believing. He's got us believing that if we do things in his way we'll get up that table. "It's very positive. The dressing room, it's not low at all. You wouldn't think we were bottom of the league with the way the boys are in the dressing room and the way training's been. Training's been high tempo. The boys look full of confidence."